Governor Cuomo took a step deeper into the partisan politics of the State Senate Tuesday night, telling two Democratic factions they’ll have to work together if the November elections go their way. Cuomo, long an ally of Republicans in the Senate, for the first time headlined a major fundraiser for the Democratic Senate Campaign Committee, and told them that he can no longer rely on Senate Republicans to approve key issues like the Dream Act for children of undocumented immigrants, and a reform package that limits campaign contributions. The governor also told the Democrats that if they win , and keep, enough seats in November, they’ll likely have to learn to work with a breakaway faction of Democrats, the Independent Democratic Conference, in order to form a governing coalition. He likened the arraignment to a “marriage”, with many compromises. Cuomo has been offering increasing support to Democratic candidates in the Senate as Republican Presidential candidate Donald Trump falls and Hillary Clinton rises in polls. The state Democratic Committee, which he controls, will be offering phone banking and other Get Out the Vote support in the next two weeks. Senate Republicans have begun to hit back, bringing up a corruption scandal now afflicting Governor Cuomo’s Administration. Chris McGrath, is the GOP candidate running in the district of former Senate Republican Majority Leader Dean Skelos, who is facing prison time for corruption. McGrath issued a scathing statement against Cuomo, after the governor endorsed the Democrat who now holds the seat, Todd Kaminsky. McGrath says Kaminsky has now allied himself with a governor “ who is right in the middle of the most serious and far-reaching corruption scandal in state history , which involves billions of dollars in taxpayer money being steered to his campaign contributors”. 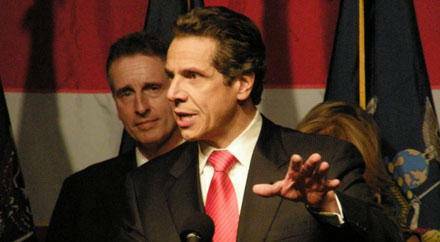 Nine people, including Cuomo’s former top advisor, have been charged with federal bid-rigging, extortion and bribery. The governor has said he didn’t know anything about the alleged wrongdoing. "Recycling (state GOP Party Chair) Ed Cox's stand (Westchester County Executive and Cuomo 2014 opponent) Rob Astorino's ‎pathetic lies that hinge on the hearsay testimony of a convicted felon is a feeble attempt by Dean Skelos' heir apparent to distract from the fact that he, unlike Senator Kaminsky, doesn't support comprehensive ethics reform," said Cuomo spokesman Rich Azzopardi.